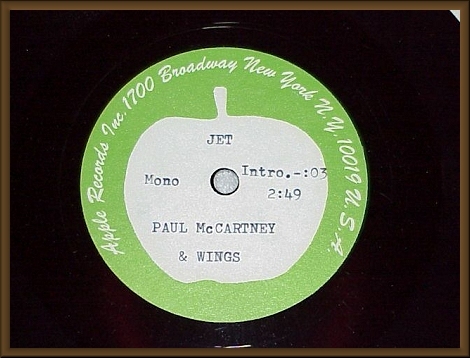 Offered here is a 7" 45 rpm mono/stereo promotional acetate by Paul McCartney and Wings. 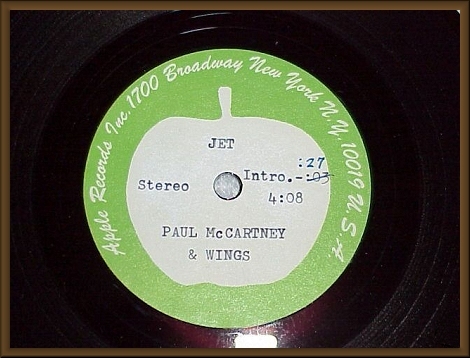 Both tracks are Jet. The mono side contains a short version of the song. The stereo side has a longer version. The disc is in near mint condition and the sound quality is great. The labels have some minor 'yellowing'. On the stereo side the original intro. time of :03 has been crossed out and corrected to :27 in blue pen.